GenealogyBank is pleased to announce that it has the five-volume List of Pensioners-1883 online, to help with your family history research. These U.S. federal government military pension records are a valuable genealogy resource actively used by genealogists to trace family lineage. 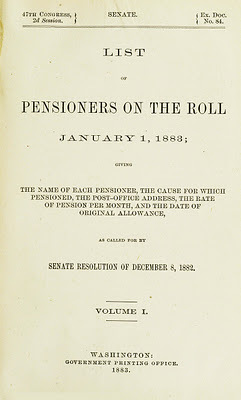 List of Pensioners on the Roll January 1, 1883; giving the name of each pensioner, the cause for which pensioned, the post office address, the rate of pension per month, and the date of original allowance. Washington, D.C.: Government Printing Office, 1883. Senate Document. Serial Set Vol. No. 2078, Session Vol. No. 5; Report: S.Exec.Doc. 84 pt. 1-5. 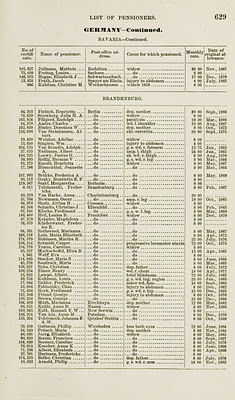 The List of Pensioners-1883 lists the pensioners by U.S. state and county. Volume 5 includes the lists of pensioners that lived overseas. List of Pensioners on the Roll. January 1, 1883…Vol. 5, page 638. Genealogy Tip: This is a crucial genealogical resource for identifying pensioners from all American wars still living in 1883 and it pinpoints where they were living—anywhere in the U.S. or around the world. This extensive U.S. military pension list includes pensioners from the War of 1812, the Mexican-American War, the Civil War, and more—making it easier to trace your veteran ancestors and relatives who received survivor benefits. Explore the List of Pensioners-1883 online at GenealogyBank and uncover your family’s past today!